There’s a video making its way around the Internet. If you haven’t seen it, it’s not hard to find. In it, there is a photographer, an MU student, insisting on his right to take photos. Demonstrators, on the other hand, insist he needs to leave. Demonstrators chanting, "Hey-hey, ho-ho, reporters have got to go!" One of the tenser moments comes when a demonstrator sizes up the photographer. They stare at each other, lips pursed. Not long after that, a little more than three minutes into the video, a reporter with headphones on comes in the screen and says something inaudible to the photographer. The photographer looks at him for a moment, then continues on. What that reporter said was, “there’s nothing to gain from this.” I know that, because that reporter was me. Chances are you’ve already seen a lot of stories about this video – not about me, but about the first amendment, and who is right and who is wrong here. This isn’t one of those stories. I don’t know who is right and who is wrong. What I do know is a strange thing happened yesterday, and I really feel the need to talk about it. Demonstrators asking the photographer to leave. The demonstrator telling the photographer to back up is a black man. Other demonstrators nearby are white, black, men, women. The photographer appears to me to be Asian, though I didn’t ask anyone how they identified. But, like me, most of the reporters there yesterday were white men. There’s no avoiding talking about race here, not in a story about a demonstration against systematic oppression. And while there were many, many moments of unity between everyone, there were other moments where that was not the case. For me, this came up in a big way later on in the morning when I accidentally found myself, along with a USA Today reporter, inside what you might call the inner circle of demonstrators. Needless to say, as journalists, we were not a welcomed presence. Raw audio from inside the the circle of demonstrators keeping the media out. A warning, there are some swear words. Then, two more demonstrators, who were black women, called for more people to come and help move us away. This really hit me pretty hard. In part, it was playing on the fear of a stereotype so culturally engrained it’s at once taboo and unavoidable, demonstrative of the very kind of systemic oppression being demonstrated against. If you’ve been following this story, you know other journalists have been asking these same questions. I don’t have a good answer for any of them. When I got back to my desk, yesterday, a reporter in St. Louis tweeted at me about a photo I had posted showing demonstrators blocking out the media. “What’s the rationale for blocking out the media?” he asked. I understand the sentiment. Here I am writing this story, after all. But I'm writing this because I really don’t know what to make of the whole day, and it sure would help to have a conversation. Teachers and students who gathered in Carnahan Quad on the MU campus this morning celebrated the resignation of University of Missouri System President Tim Wolfe. Cheers of glee erupted as protesters learned the news that Wolfe was stepping down. Faculty members and students walked out of classes to support the cause, led by the group Concerned Student 1950. The group has called for the removal or resignation of President Wolfe for months because of his lack of response to racist incidents on campus. More than 100 students attended a rally held on MU’s campus Thursday. The rally was started by the group Concerned Student 1950 in protest of UM System President Tim Wolfe and in support of Jonathan Butler, the graduate student who embarked on a hunger strike until Wolfe resigns. Following Tim Wolfe’s resignation Monday, Concerned Student 1950 held a news conference at Traditions Plaza to talk about the university’s action, and to voice their reactions. 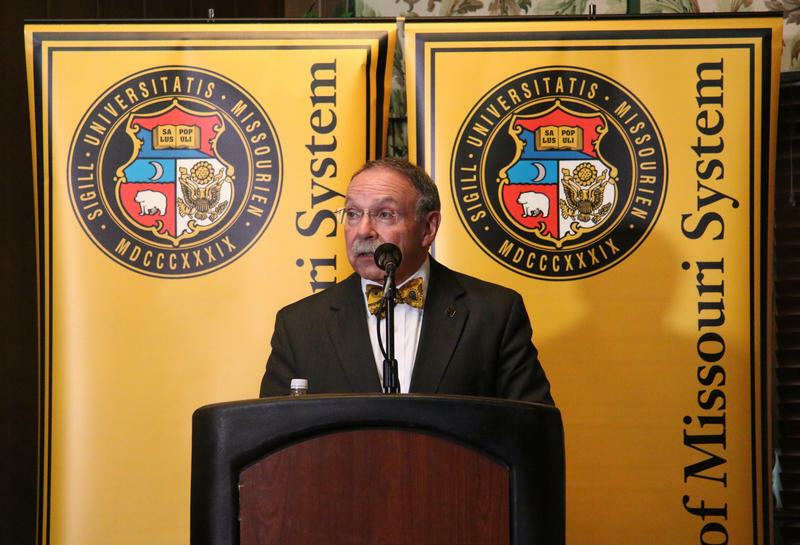 A number of state and national politicians released statements Monday in response to former UM System President Tim Wolfe's resignation.